Our visit to Andersonville National Historic Site in Georgia started with a familiar dance. A ranger handed me a driving tour. I handed it back. “We’re going to walk,” I said. The ranger protested. It was too hot to walk. We had better drive. Clearly, he had gone to the same National Park Service ranger school as the ranger in Vicksburg. But no worries — it was not Vicksburg hot that day. And, unlike vast Vicksburg, it was only a couple of miles to walk the driving tour. 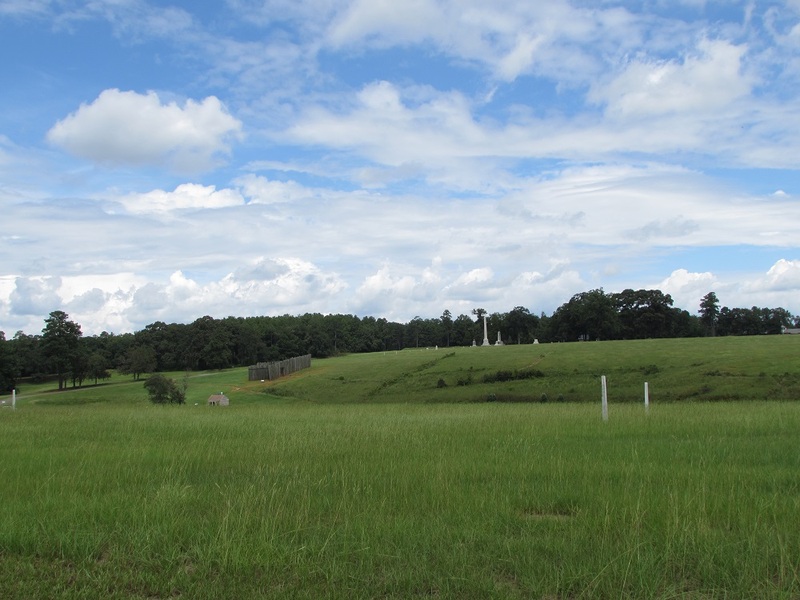 Andersonville NHS was once the site of Camp Sumter Military Prison, a Confederate POW camp notorious for its inhumane conditions and 29% death rate. Camp Sumter opened in February 1864 and within five months, it held over 30,000 prisoners — 20,000 more than it was built to contain. Along with the overcrowding, there was no food, the water was contaminated, and shelter — in the heat of a sweltering Georgia summer and the surprisingly frosty cold of a Georgia winter — was minimal. 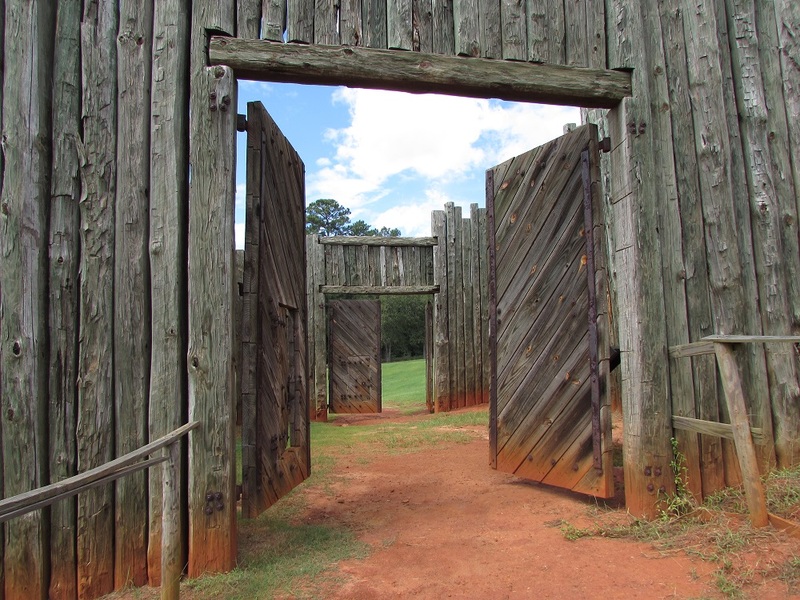 The prison area was surrounded by a two 15 foot high stockades. 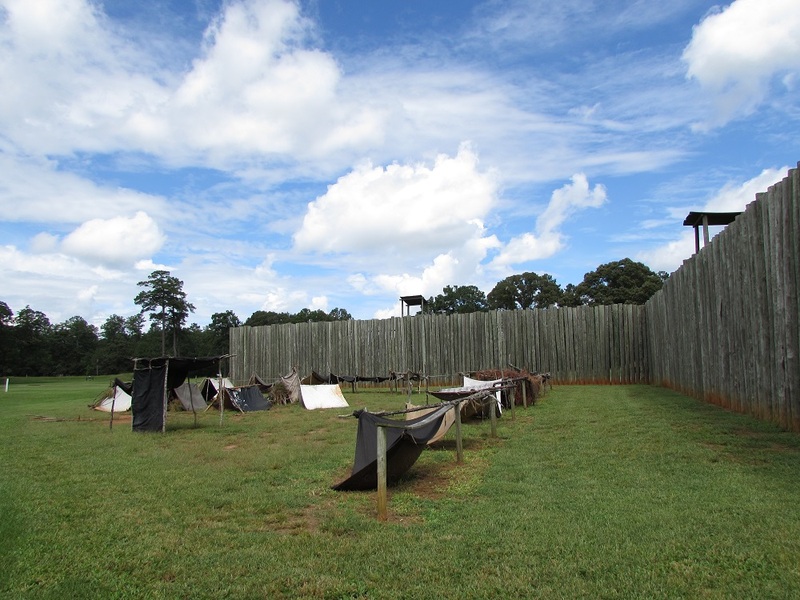 A marked line (at first, it was a shallow trench; eventually, posts were erected) about 20 feet from the inner stockade was called “the deadline.” Any prisoner who crossed the deadline to go within 20 feet of the stockade was shot. Guards positioned in towers above the stockade would amuse themselves by dropping food into the forbidden area between the deadline and the stockade, to lure prisoners across the line and to their death, or to torture them with food they couldn’t reach. The prison hasn’t been reconstructed in its entirety. There’s a wall here, a gate there, a small patch of tents, to represent what it once was. I stood on a small hill, southwest of the prison site, where the home of the prison commander had stood. It’s hard to imagine, from the bucolic landscape in front of me, the miserable hell-hole that occupied it 150 years ago. After the war, Captain Heinrich Wirz, commander of Camp Sumter, was tried for murder and for violating some kind of pre-Geneva Convention convention of war that said that prisoners could not be denied food, water, clothing or medical supplies. He was found guilty and hung in the courtyard of the Old Capitol Prison in DC, which once stood where the Supreme Court building is now located. Many believe him a scapegoat. He had, after all, asked the Confederate government for more supplies to care for the prisoners and the Confederate government, barely able to supply their own soldiers, much less prisoners, refused him. But he was also cruel, believing that extreme harshness was the only way to maintain order in the overcrowded prison. It was long past noon when we finished our prison site tour and Mr. History Tourist and I were beyond ready to eat. We still had the Andersonville cemetery to visit so asked a ranger for a close-by restaurant recommendation. He suggested a place in downtown Andersonville. So we drove into Andersonville and there, at the end of their one block main street, was a monument to Captain Wirz. Dedicated in 1909, its inscriptions read, in part: “To rescue his name from the stigma attached to it by embittered prejudice this shaft is erected by the Georgia division, United Daughters of the Confederacy…Discharging his duty with such humanity as the harsh circumstances of the times, and the policy of the foe permitted Capt. Wirz became at last the victim of a misdirected popular clamor.” There’s also an annual memorial service for Captain Wirz, conducted by the local Sons of Confederate Veterans. 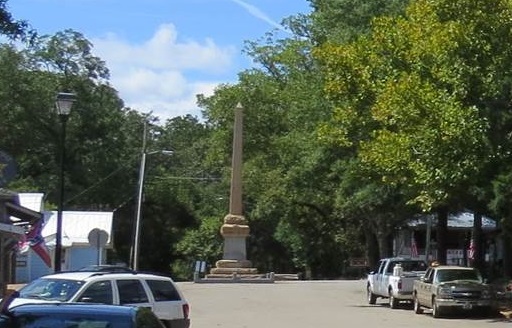 Downtown Andersonville is one short block and the ranger’s restaurant — the only restaurant in town as far as we could see — was across from the monument. 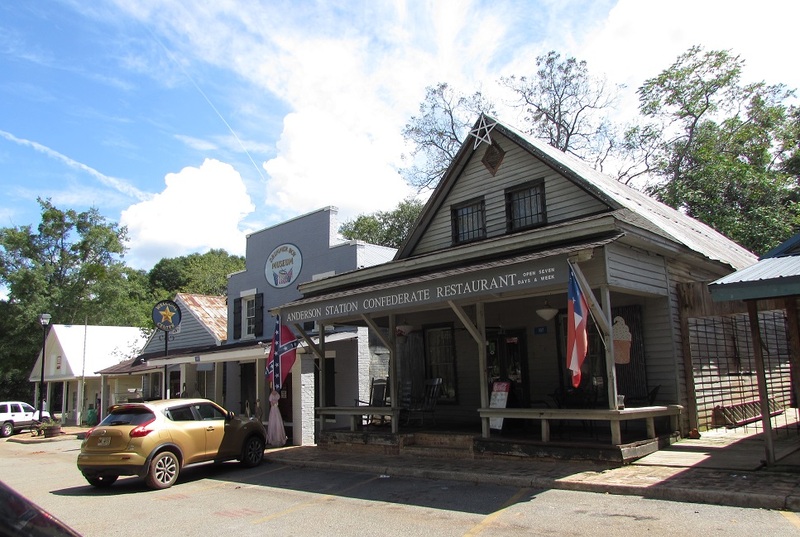 Called Anderson Station Confederate Restaurant, there were two Confederate flags flying out front. And if the two flags weren’t enough, there was an extra large battle flag covering the back wall, inside. Two African American women came out of the restaurant, with ice cream cones in hand, as we pulled up. I wish I had a journalist’s nerve, so that I could have asked if they had any qualm about frequenting a business that flew Confederate flags. I don’t. So all we had was our speculation that people in the area had probably become “flag blind” — too familiar with it to see it or care about it. Just wait until you get further south. And we were just in the tourist areas.